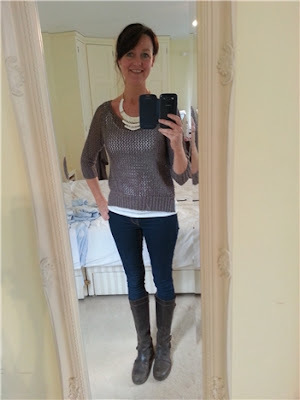 I don't know about you but after the long dark winter, with lots of winter comfort food and red wine, I have gained some weight - not a lot but enough to make some of my jeans not fit - AT ALL! I know what I need to do to make them fit and operation "get back into some of your jeans" is under way (theoretically that is!). So I got all my jeans out this morning to see what I have, what fits, what doesn't, what needs to be sent to the charity shop etc etc and I am amazed at how many pairs of jeans I have! How about you? How many pairs? Do I own a lot or little do you think? 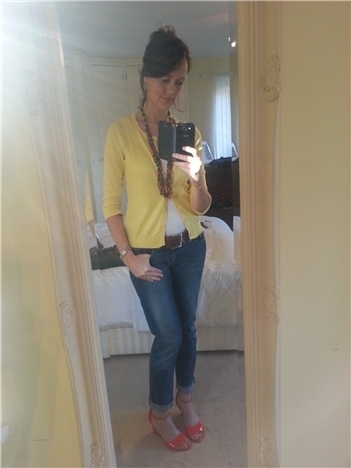 Onto what I've been wearing this week - so nice to have the sun shine and get some colour back into the wardrobe. World's most boring ouftit? Check. All really old stuff not worth talking about but I was comfortable! 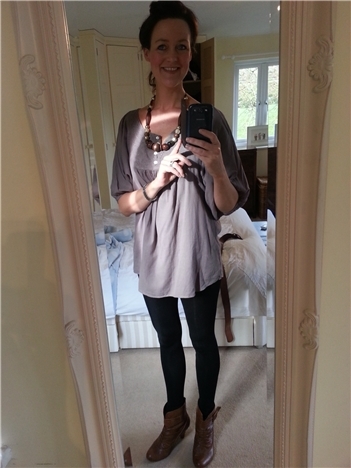 Bit of a rubbish outfit but it was freezing this day and I was out and about - it's all about the necklace and the jumper which was £10 from Matalan, can't wait to wear with white skinny jeans. Jumper available today but necklace has sold out - similar here. Orange shoes LK Bennett and bought about 2 years ago and this was their second outing - how wrong is that? NEVER KEEP ANYTHING FOR BEST - prepare to see them again soon! 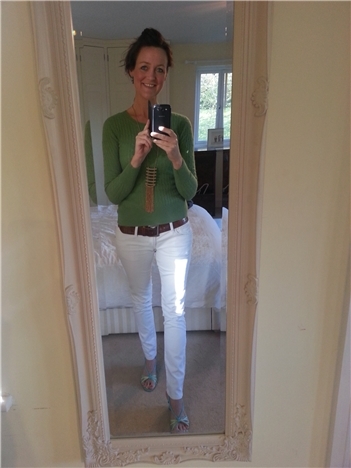 Green jumper is a good TK Maxx bargain buy last year and as it was a cold start to the morning yesterday I went for this with white jeans - I LOVE WHITE JEANS! Shoes are old M&S ones (10 years old I reckon) and I swapped them in the end of mustard yellow ballet pumps and also took my mustard yellow bag with me - to the farm! If you're wearing white, just wear it and don't be precious about them getting dirty. See, told you that in theory I was ready for exercise, still remains to be seen if I actually 'do' some. 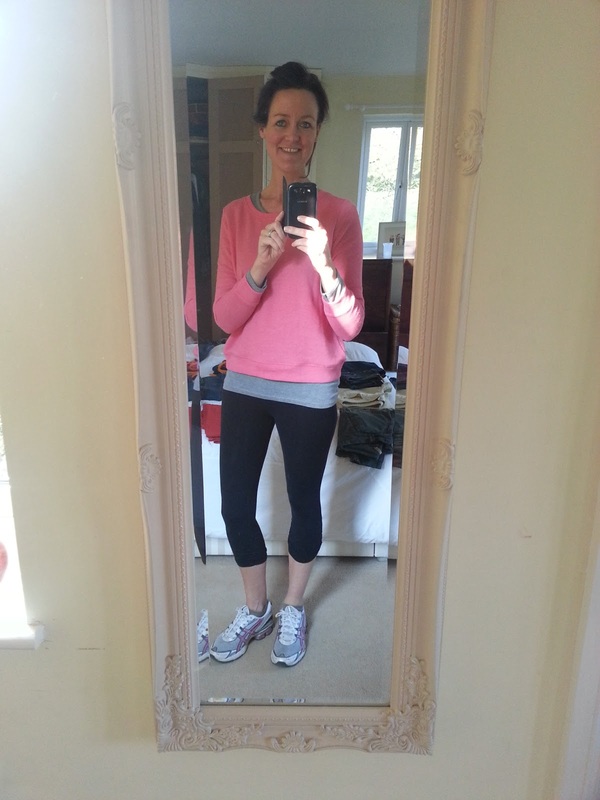 I ran for 1 minute on Monday and nearly died. I kid you not! I love this H&M sweater - it was £2 when they had their silly flash item sale last month. 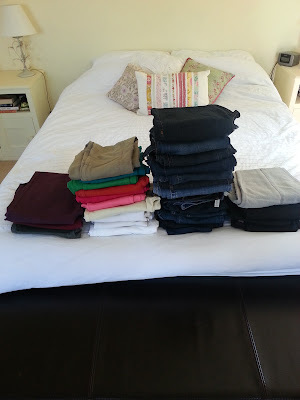 So, jeans .. how many pairs? What styles? I also don't have cobalt blue or purple .. in fact, I can see a few pairs I need to purchase this summer! But I am going all out for floral and paisley as they're so fresh and EVERYWHERE! Your challenge is to find out how many jeans you have that are NOT from Zara ...... ! Try using a Dylon dye in your washing machine for the red ones. Was speaking to someone recently who had revamped her wardrobe this way! Worth a try?? 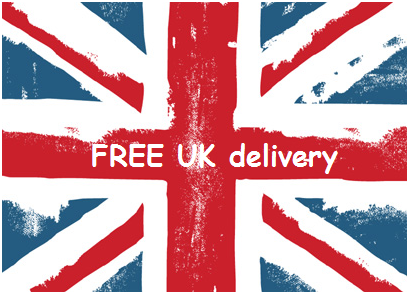 Save you buying ANOTHER pair of jeans!! I think you beat me on the numbers front. I just went "gulp" when you went 8 pairs of skinny jeans, 7 pairs of straights and 9 pairs of coloured. I have a few but mine are quite boring in comparison to yours. I have white, blue, black/grey, teal and snakeskin. That's it. Colours scare me a bit. eek snakeskin - I need these!! I think with these and sunglasses I have a problem! I live in jeans, that is why I have so many and I rarely throw out - I can't fit into some and some drown me - I should stop keeping and start recycling! Keep the boot cut, there is due to be a big pendulum swing away from skinnies, they are so done to death, the jeans brands MUST get us all into boot cut or flares to stay in business! LOL you might be right! I will keep and put in a random cupboard! I don't think it sounded rude at all!! My favourite looks are 2 and 4. 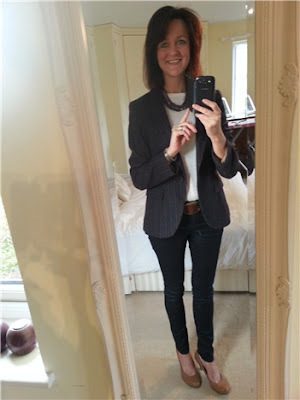 I love jeans and blazers and I am all over the pattern! I would be too embarrassed to say how many. I think I have double of what you have. YAY that's brilliant - I don't think I have too many and I do need more so I will be well on my way to catching you up soon!! oh yes do come and play catch up - I'm following Iva's lead on the jean count! I do wish Sainsbury's would hurry up and put their stock online! Hi again that should read waxed not axed, sorry! Far too bloody many to count here Fiona, plus I find it hard to throw jeans that are now too big for me into the charity shop as I think if I'm lucky enough to become pregnant again ill wear them so I have quite a few pairs that are about a size too big. I'm a bit of a blue jeans addict and am always on the hunt for the perfect blue pair. Love the yellow cardi outfit (surprising I know!). I always think I'll keep the big ones for 'those' moments when your small ones don't fit! I hate throwing things to the charity! 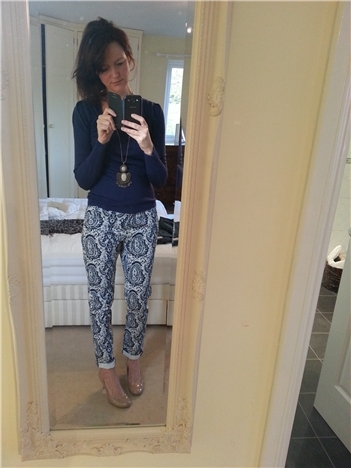 I love those patterned jeans on you and I honestly think you may have more pairs of jeans than I do! Problem is I only wear a few of the pairs so should get rid of the others really. I am trying more and more to wear my clothes - not just the same few. Having Avenue 57 and this blog has helped me no end in achieving this! Set yourself a challenge to NOT wear the same pair in a month! Am impressed with the amount of jeans you have! They're so versatile and (to quote all the magazines) you can dress them up or dress them down so you can't have too many, no?! Absolutely you can wear! I don't follow the rules. I follow what I like! I used to spend loads on one pair of jeans, and then they went out of shape - now I head straight to H&M, buy a pair for £30, wear them solid for about six months until they can be worn no more, bin them and then out for my next pair! Am totally inspired by you girls to go to Zara for my next pair though! I buy cheap and I buy lots and that way they never wear out! You carried the printed jeans look so well. Ahhh...to be tall and thin! (says the girl who's munching on crisps as she's typing this out). I don't really have that many pairs of jeans. My mom nicked half of my meagre collection. What's left is a couple of Uniqlo, a couple of James Jeans and a 7 for all mankind which will be my next cut offs. I need to cut some of mine off - I never have but it's a genius recycling idea - why pay for cut offs when you actually have some ready at home? I am crap with cutting in straight lines - what if I have one hot pant leg and the other a mid thigh length? I downloaded the app last monday and have since not been back to it!! Try it, it really is good. Plus I like the idea of having a aim, progress and a time scale. just need to find 1 more hr in the day and I will!